Happy Saturday afternoon to you all! I’m taking advantage of children napping (sweet mercy!) 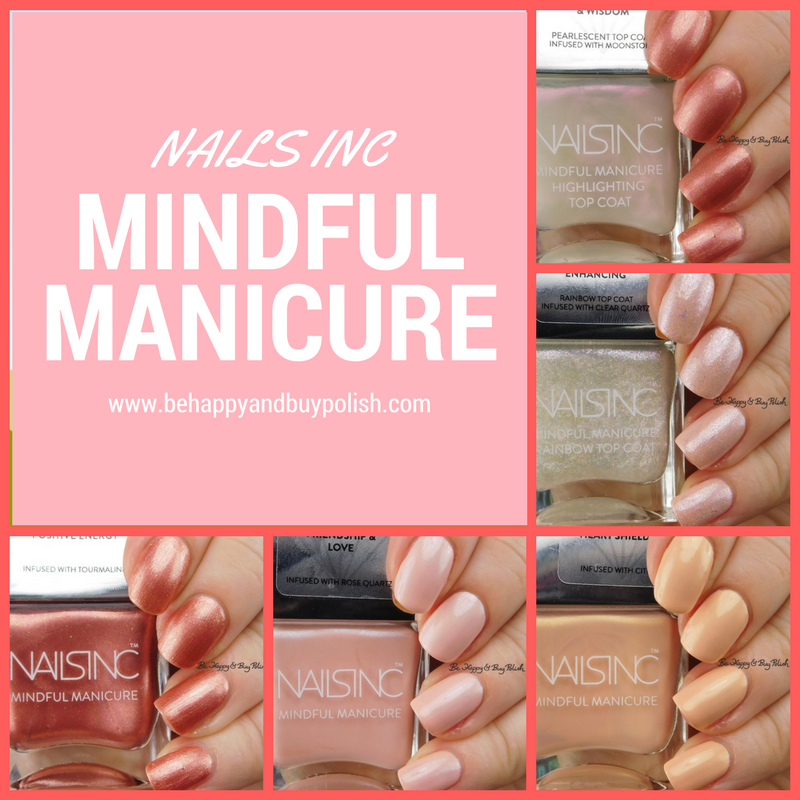 to type up this post on a new polish line from Nails Inc called the Mindful Manicure collection. This includes shades in Better Together, Futures Bright, And Breathe, Balancing Act, and Good Vibes. These are infused with different minerals that are supposed to enhance your mood as you wear them. This limited edition line is currently available at Sephora.com for $15 each. Better Together is a soft pink with blue shimmer. 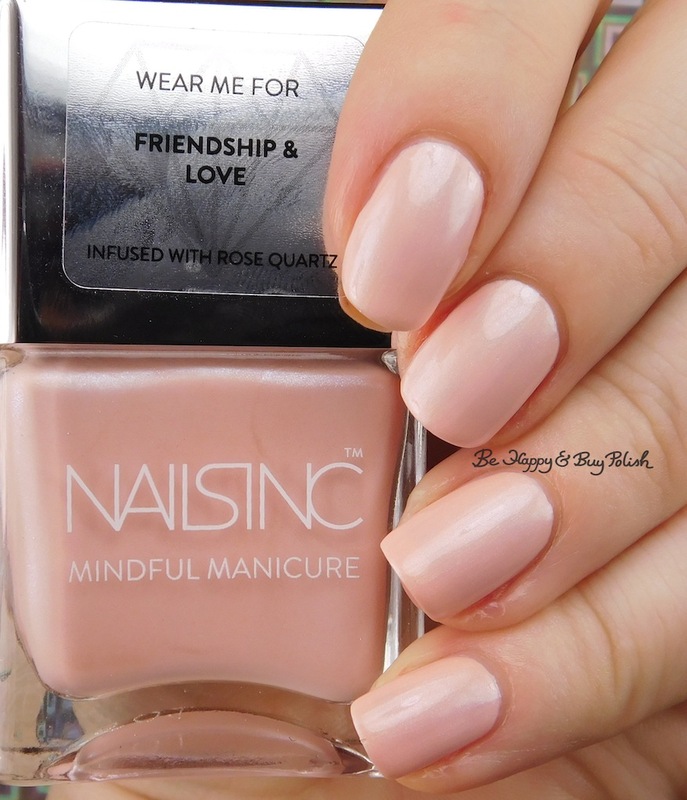 This is infused with rose quartz, to be worn for friendship & love. Formula is a bit thin, and not too streaky. This is 2 coats and no top coat. Good Vibes is a “rainbow top coat”, slightly pearlescent with rainbow shifting flakes. This is infused with clear quartz, to be worn for aura enhancing. This has a good consistency and is easy to float on the nail. This is 1 coat and no top coat over Better Together. 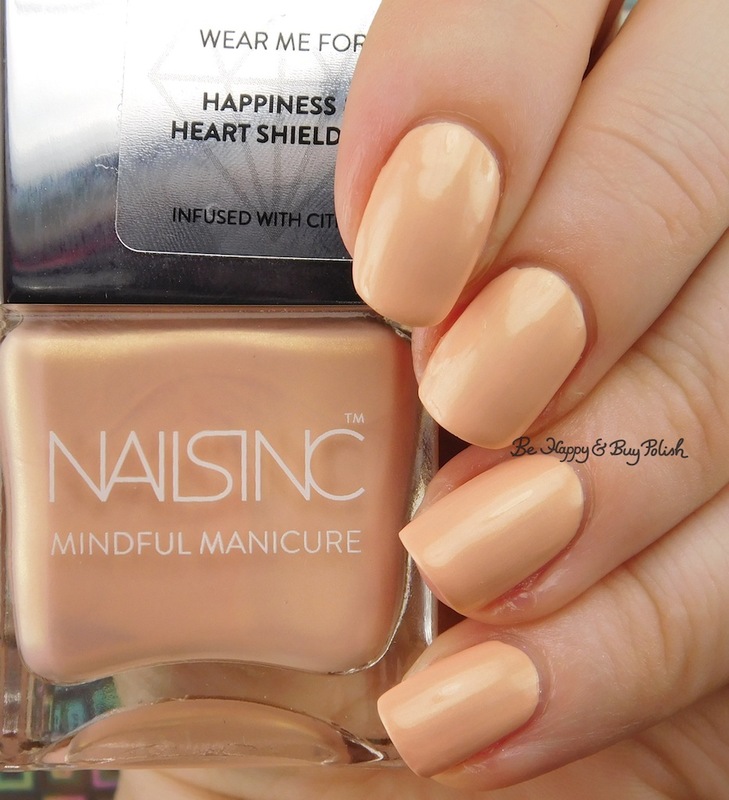 Futures Bright is a bright peach-pink with golden shimmer. My photos all turned out a bit washed out. This is infused with citrine, for happiness and heart shielding. Formula is a bit thin and a bit streaky. This is 2 coats and no top coat. And Breathe is a burnt red-pink with gold shimmer & dusting. This is infused with tourmaline, to be worn for stress relief & positive energy. Formula is pretty brush-strokey but has a good consistency. This is 2 coats and no top coat. 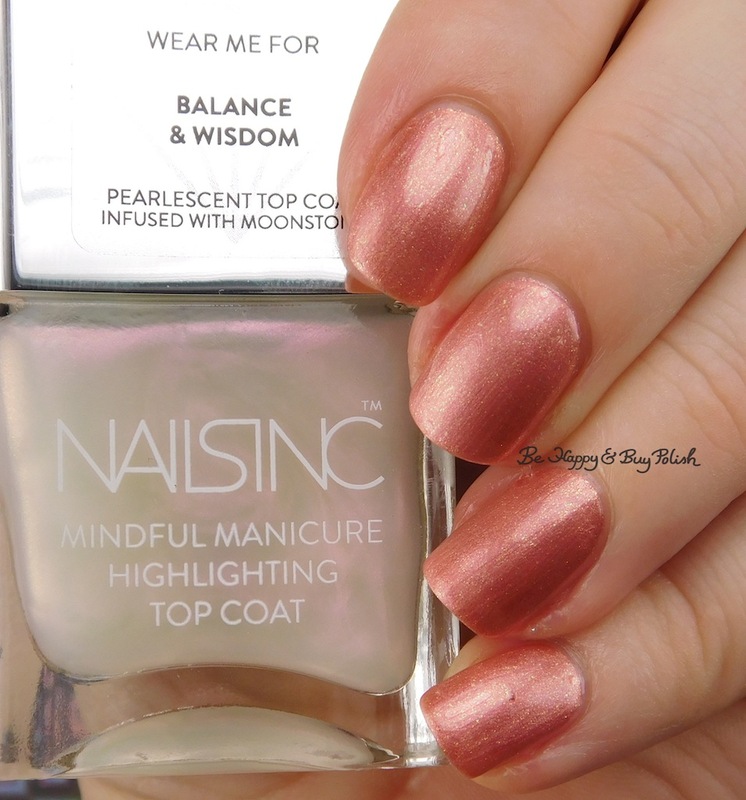 Balancing Act is a slightly pearlescent top coat with pink-purple shimmer. This is infused with moonstone, to be worn for balance & wisdom. This has a good consistency but it was hard to see the effect on the nails. Whomp whomp. This is 2 coats and no top coat over And Breathe. 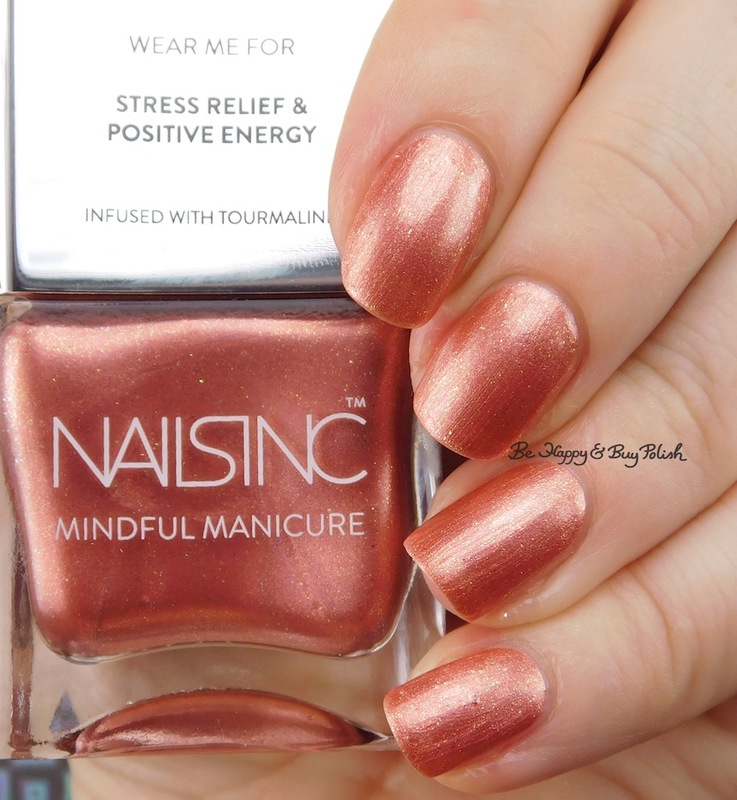 This is my first experience with Nails Inc and I rather enjoyed it. I like the brush – it’s a wide rounded brush which I prefer. Not crazy about the bottle shape, but whaddya gonna do? 😛 Now, I haven’t been able to do a wear test on any of these shades so I can’t speak to the mood-enhancing properties; but it’s always good to slow down and take some time for yourself so I’m definitely all about mindful manicures! My favorites here are probably Good Vibes and Better Together but I’d love to hear your thoughts on this line and what your favorite is so drop me a comment! The colors are pretty! I like them. 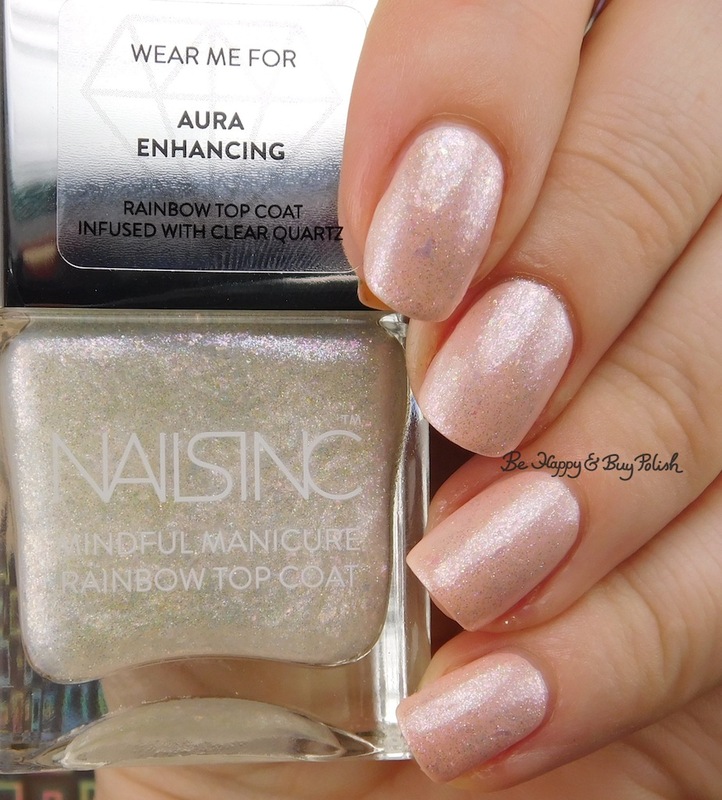 When did Nails Inc change their bottles?? ?